The most prevalent subject of poetry among poetry lovers is “Sad Poetry”. Sometimes it’s tough giving words to our feelings or thoughts. But sometimes write down “Pain” in words make us feel better. It’s a way just to get “pain or sadness” off our chest. 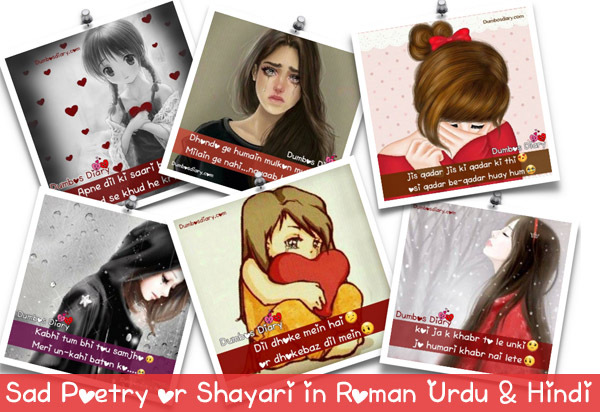 I’m sharing some emotional heart broken sad poetry and shayari with images in roman Urdu & Hindi. I used sad theme in this sad poetry to make it more approachable and less overwhelming. We all get sad in our life many times. And love to read sad poetry or shayari. Hopefully, you’ll love this awe-inspiring sad poetry. You can also share it with your fellows or friends as SMS. Get through this awesome collection of sad poetry. Tanha raat hai ya main…? Raiza raiza ker ke bakhair deti hai…..
Zindagi uljh sii gai hai….